Question: My two-year-old daughter often sits with us at the table and eats—usually. My question is, should I have her eat if she doesn’t want to? Should I force her to try new foods? Should I make her sit there until her plate is clean or until she’s eaten two bites of peas? If she asks to leave the table before her father and I are finished eating, do I let her? So I’d like you to ask yourself, if you’re asking an “expert” how to feed your own child… maybe at some point you were led to believe that other people’s opinions and feelings are more valid and important than your own. The only question I believe you need to ask here—to yourself!—is, “what feels most loving to me now?” How can you best show my daughter that she is completely loved—even at the dinner table? By the way, my sister-in-law still speaks about how traumatized she was by having to sit at the dining room table long after every one of her siblings was excused, until she ate those last three cold and wilting peas. As she relates it, as a child she rebelled and tried to assert her autonomy for hours and hours saying, “I don’t like peas!.” Unfortunately she’d eventually break and eat them—her dad was a military Colonel at the time, so he knew how to win a battle! But, at what cost? We never crave food as much as we crave love. And you can teach your children self-love via eating food. Yes! Offer them good, wholesome, healthy choices—plenty of them—this will spark their creativity and feelings of empowerment as they can make their own choices and feel your love as they do so. If you find that, as an adult, you are unsure if you are in a battle with food yourself, here’s an excerpted exercise from Soul-Full Eating, that’s often very revelatory for my readers. Try it and let me know what you find out. And remember, it’s through conscious parenting that we often discover the spontaneous, joyous, oh-so-loveable “lost child” in ourselves. Spend five minutes meditating on or writing about the following questions: When you were young, were you given praise for finishing every last bite on your plate? Were you ever coerced into eating even after you felt full by being told about the starving children in other parts of the world or about how others suffered and sacrificed to provide you with your meal? If so, then it’s likely that guilt has been coloring your world when it comes to eating—guilt for not eating enough, or guilt for eating too much. We are all born with an internal comfort-seeking mechanism—the Soul—The “Voice” of sanity. However, for many of us, it’s been layered over, smothered and silenced by the guilt inherent in our fear-based conditioning. Just for one day, do only what you genuinely love to do. Can you do that? Lucky you, if you don’t have to put a hold on everything and completely rearrange your entire life to do this. That means you are already being True to your Soul! But if you do have to do a bit of finagling of time and space in order to allow your authentic-self to emerge, that’s still fine. Why? Because now you can see that you really do deserve to love yourself more. Once you do this once, there may be no turning back! Eating what you really don’t love, without love, is just one small symptom of a greater picture of denying your brilliance and self-worth. Greening the Planet one plate of food at a time. Go Green! What happens when you cross a tree-hugger with a foodie and add a healthy helping of soul? 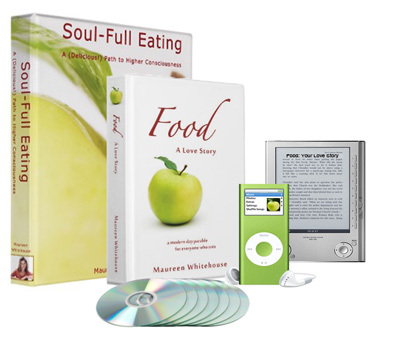 You’ve got what author Maureen Whitehouse describes as the new brand of Soul-Full consumer in her award-winning and best-selling book, Soul-Full Eating: A (Delicious!) Path to Higher Consciousness. Soul-Full Eating is most surprising in its ability to flawlessly intertwine concepts that, until now, have not been considered in the same genre. Whitehouse doesn’t expect people to completely change their lifestyles overnight, but instead encourages them—and provides the tools—to become educated about where their food comes from and how it effects their well-being. She invites them to take whatever steps they can towards living a more authentically motivated life. Whitehouse reminds us that “going green” doesn’t have to be an us-against-them polarizing message, but one that is all-inclusive and that actually makes us feel better about our lives on a concrete level. Her message helps us to realize that via this practical path, filled with appreciation for the planet we live on, we can simultaneously gain a deeper love for our own lives and give up the “blame game” altogether. If you’re interested in learning about what you can do to green your lifestyle in a fun, friendly and encouraging environment, then Soul-Full Eating for you! Join us on this Delicious Path. We’d like to actively involve as many people as possible in the mission to eat with love! We think this message is so important that we’re working on building a world-wide online community that will allow us to interact with one another in an engagingly fun, friendly and supportive atmosphere. Even if you’re only “green curious” and not entirely green conscious, and have no idea where and how to begin… you’ll find that Soul-Full Eating takes the mystery—and misery—out of living a more sustainable lifestyle. As a fashion model in New York and Europe, Maureen learned to stay thin as well as healthy and sane. Twenty years later, Soul-full Eating shares these insights.